In March I was delighted (and a little bit star-struck) to get an exclusive opportunity to join a select group of industry professionals to meet with celebrity chef James Martin for the launch of his new cookery school – ‘The Kitchen’. 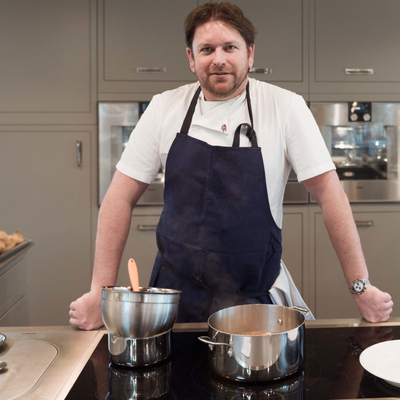 The Kitchen is a purpose-built space in the grounds of one of my favourite hotels – Chewton Glen – and James’s flagship restaurant and cookery school that sets the stage for enjoying and learning all about food and cooking. James has a long-standing relationship with Chewton Glen, having worked there as a teenager. The Kitchen’s design is open plan; bi-folding doors and glass panelling flood the rooms with light. Surrounding the venue are raised beds and a greenhouse where herbs and vegetables are grown year-round to supply The Kitchen with a feast for the senses. Our day started with coffee and pastries followed by a sneak peek at what was growing in the greenhouse. After our insightful stroll we returned through the garden into the cookery school and settled into our workstation to focus on the recipes. The main course was Poulet Sauté au Vinaigre with mashed potato and I couldn’t believe that we were going to make classic Chocolate Éclairs for the dessert. Having never baked in my life, this was going to be interesting! The gleaming demo kitchen was set ready and it was time to get stuck in. James has a very down to earth manner, and is full of fascinating facts which he shared with us as we cooked. He started off making choux pastry and annoyingly made it look so easy – it wasn’t. The piping of the choux buns did make us laugh, as getting the right width and length obviously made all the difference between a good and bad bun. Whilst the buns were cooking, James showed us how to dissect a whole chicken into 8 pieces. This was a skill I wish I’d learned a long time ago as I could see how easily it could be used for so many other recipes. It’s also a great technique for making sure all your dinner guests get an equal portion. We also used concasse of tomato (which is a skill I learnt at catering college), so it was great to be reminded of it 34 years later! The recipe also has tarragon which is one of my favourite herbs. Whilst the chicken was browning, we started to make the chocolate fondant. I became a little unstuck at this stage, as the icing sugar and chocolate was getting lumpier and lumpier. James came to my rescue and used all his strength and expertise to pull it back to a smooth paste – my hero! My éclairs didn’t look too shabby in the end, and whilst the Poulet Saute au Vinaigre was simmering, we all sat down to taste our efforts with the divine creamy potato mash, which James had made. The whole morning was a special experience with some really magic moments, wrapped up with some new cooking skills. Many thanks to Chewton Glen who hosted the charity event and helped raise over £5000 for ‘Meeting Needs’. The Charity was founded by leading figures in the UK conference and events industry, with the objective of raising funds for worthy causes who may not have the resources to raise sufficient funds without additional contributions. Many needy causes do not have access to public funding and Meeting Needs can provide financial support to these types of organisations through various fund-raising initiatives and activities. Special thanks also to Lisa and the team at Chewton Glen for providing this opportunity and making my stay so enjoyable…and of course to James Martin who has given me the confidence and knowledge to impress my friends and family with my new culinary expertise! If you would like to try my recipes yourself, feel free to email me at penny@firstchoice-ce.co.uk and I will send you a copy.